Largest of the 'small' antilope. Upperparts rufous yellow-orange and underparts white. White har extends onto front of chest. Relatively long neck, medium-sized ears and short tail with distinguishing black tip. Has pale throat patch and off-white areas on either side of nostrils and above eyes. Hair on back and underparts may have a curly appearance, particularly during winter. Only ram has horns and these are short, erect and partly ridged. Open short grassland with taller grass patches for cover. Occur in pairs or small parties consisting of one ram and up to four ewes. The ram is vigorously territorial. Communal dung-heaps serve a territorial marking function. When disturbed Oribi give a sharp whistle or sneeze and run off rapidly with occasional stiff-legged jumps displaying black-tipped tail. Inquisitive, however, and will turn to look back at source of disturbance after running a short distance. Also lie down in taller grass if disturbed, with head erect; in this position they are difficult to detect. Reproduction: Births have been recorded throughout the year but the majority of lambs are dropped during the wet summer months. A single lamb is born after a gestation period of about 210 days. The lamb remains hidden for as long as 3 - 4 months before joining the group. 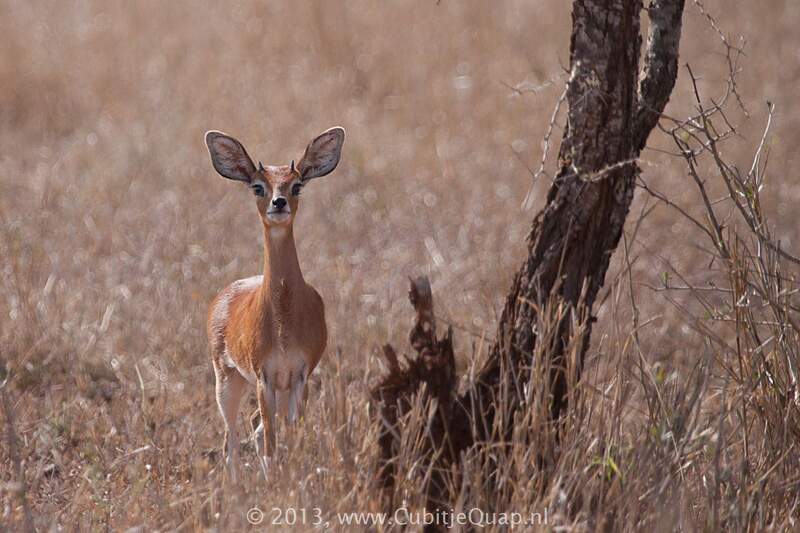 Oribi are principally grazers but occasionally browse. They show a marked preference for short grass and will move if grass becomes too long. They are independent of drinking water.